The opening scene of this narrative describes a playoff game between the New England Patriots and the Oakland Raiders, and the obscure NFL “tuck rule” that favored Tom Brady’s team. Football, alongside baseball, is one of our favorite pastimes. The rest of the world watches soccer, a much simpler game with a huge following – a billion people watch a World Cup final. But we enjoy our sports and their complicated rules; it is like a puzzle to be solved. This is fun and harmless. However, complexity brings much more adverse consequences in other areas. If our financial security or health is at stake, complexity may end-up costing us a lot. This is a lot less fun, and potentially harmful. The book explores the costs we all pay for the complexity in our socio-economic system in health care, energy and electricity, finance, taxation, laws and regulations, and technology. Yet complexity is not in our DNA. Our Constitution is legendary in its brevity and simplicity of purpose; our early inventors thrived to make our world simpler and easier to live in; and we won the Cold War because our market-based approach to economics was much more effective than central planning complexity. Conversely, many of our current policy failures are due to their complicated nature. Increased political polarization has led us away from simple and practical solutions. In the private sector, the increased roles of finance and globalization have led to many arrangements benefiting the few at the expense of the many. And the private and public sector cannot succeed in untangling themselves, creating collages of complex interactions. It is imperative that America seeks simple solutions to our current issues. Otherwise we are condemned to a future of declining economic competitiveness, increased inequality, and erosion of the social fabric of our country. 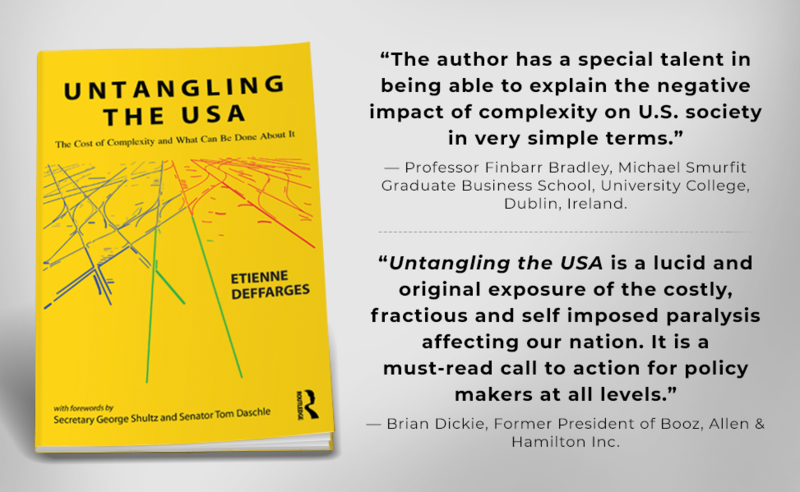 ‘Untangling the USA' is a lucid and original exposure of the costly, fractious and self imposed paralysis affecting our nation. It is a must-read call to action for policy makers at all levels. Former President of Booz, Allen & Hamilton Inc.
A fascinating look at all aspects of our world, from sports to government regulation. Etienne Deffarges’ unique insight is that we started with simple and clear policies, which grew increasingly complex over time. Why this happened and what to do about it leads to a captivating examination of our society. Partner, Hillsven Capital; Former CEO and Founder, Qualix Group, and Comergent Technologies; Global Board, Harvard Business School Alumni. A thought-provoking read for anyone trying to find simple and effective solutions to a complex and often ineffective healthcare system. This system inhibits our ability to make sound and logical decisions to reduce costs, and improve quality and access to care. Former President and CEO, Catholic Health East; Past Chairperson, Board of Directors, Catholic Health Association of the United States. The author analyses a number of sectors in addition to health care including energy, finance, taxation and utilities. He effectively contrasts them to simpler and oftentimes more efficient systems in other industrialized countries . . . His book also helps us understand why so many Americans feel overwhelmed. They no longer understand why managing one’s health, savings, or energy needs to be so complicated. Etienne’s advocacy of simple but strong regulatory incentives to replace today's maze of complex regulations so that our private sector can respond in an optimum way should be well received by all who believe America can find new paths to economic prosperity. Well written, thoroughly documented, and filled with convincing analyses, engaging anecdotes, and personal stories, Etienne's book and its journey through complexity will appeal to anyone interested in a productive dialogue on ideas to improve our future.